Have you ever participated in a round Robin exchange? I joined an indie polish only one on TPF and recently finished my selections from the box and shipped it to the next recipient. It was a lot of fun going through the box and looking at all the pretties and trying new brands. You can see my selections here. I needed a break from green nails this week and I have a lovely grayed out blue cream that I found in my purge box. 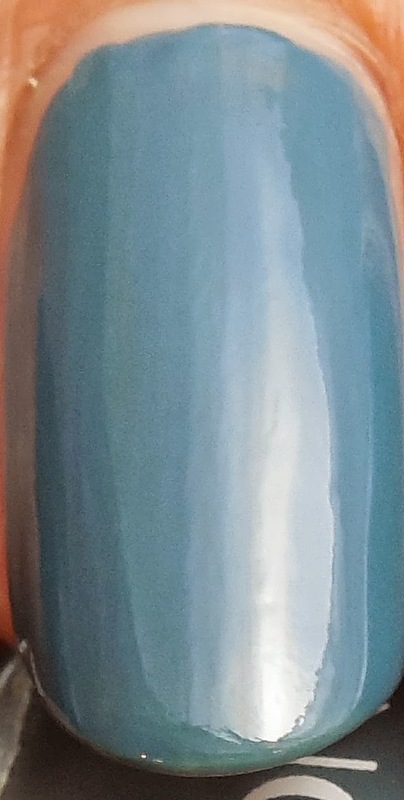 It's a Revlon Colorstay called Blue Slate, and I have no idea why I wanted to purge this wonderful color. It applied smoothly like silk with no steaks and dries to a high shine. Overall is a fantastic polish and going back into my collection. Two coats here with no topcoat. I thought Blue Slate would be great undies for Polish Addict A Beautiful Mess, a dark cornflower blue crelly with purple, teal, gold, and sparkly holographic glitters. I love the combination of colors and really works well for spring. I used two coats over Blue Slate and used a layer of topcoat to smooth the glitters. In hindsight, an additional layer of Gelous may have smoothed it further. This particular polish has me thinking of colorful Easter eggs. I've been wanting to try Polish Addict since discovering it in Instagram, and I have to say that so far I'm impressed with the lovely glitter creations that range from delicate to straight out bling. I lucked out further when I caught a sale and ordered a few minis to try. I look forward to showing you more of these gems soon! Oh that round robin exchange sounds so cool! How does it work? Do you select polishes to keep and replace them with others from your collection? Great combo pairing Blue Slate with A Beautiful Mess! The Polish exchange is so fun! You should join the next round. I think you need to establish yourself first with 200 posts but that should be easy. There's List of participants and one you get the box you choose whatever polishes you like and replace with ones you want to get rid of. Its a Cheap and fun way to share and try some new polishes. There's a premium box and general swap box as well. Keep a look out for sign ups! Loving the blue slate on its own! I can't believe I was ready to part with this, it's gorgeous! And Colorstay is a wonderful brand too. A Beautiful Mess is so pretty! I recently just ordered a few polishes during the Sale Polish Addict had about two weeks back. Now I'm thinking I should have gotten this one! It is perfect over Blue Slate, which is also wonderful by itself. I can't wait to see those swatches!! I hope you get your order soon.